With the theme of this year’s National Nutrition Month, Go Further with Food, the focus is on not generating food waste. USDA estimates that we waste almost 30-40% of food. There are ways to bring it back into the food supply through composting or reusing the leftovers through creative recipes. Just make sure that the leftovers are stored properly before use so that there is no risk of food poisoning. Check out storage tips here. Whenever I have leftovers that are not really enough for a whole meal or don’t deliver the same satisfaction when reheated, I try to make it into something else. Not only it is a completely new meal served fresh but also uses up the leftovers, no food waste! My husband loves to go fishing and we love eating the fish he catches. Whenever the family gathers we make it a point to take out some of the Alaska Sockeye Salmon he caught. The filets are packed at the site in Alaska and kept frozen. We defrost only what is needed. 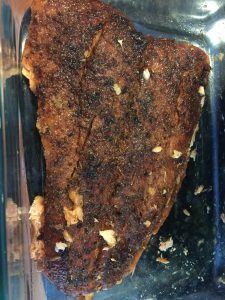 Our favorite is to marinate with a spice rub and grill the filets. This last time we had an entire filet left over. Fish really doesn’t taste the same or have the same texture when reheated. Although, Salmon is a fattier fish and can be utilized into other recipes. The easiest way to use up leftovers is to combine with pasta. I wanted to try this new bean pasta and this was a great opportunity. I pulled out some more favorite ingredients (olive oil, shallots and sun-dried tomatoes) and boiled water for pasta. 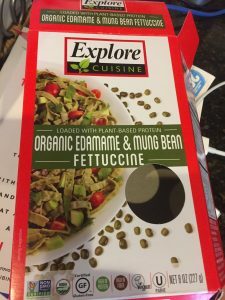 I started with the Explore Cuisine’s Organic Edamame and Mung Bean Fettuccine. It is an 8 oz. box with four 2 oz. servings. The pasta is only about 2-3 inches long fettuccine. It cooks in only 6-8 minutes. One serving provides 180 calories, 24 grams protein and 4 grams of fat. Compare that with regular pasta serving providing a little over 200 calories and only 8 grams of protein per 1 cup serving. 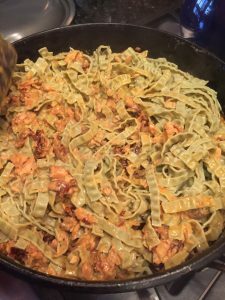 There are other options of high protein pastas from Explore Cuisine to try as well. By the time the water boiled and the pasta cooked, I heated the olive oil in a pan, added sliced shallots to it and sautéed until lightly browned. 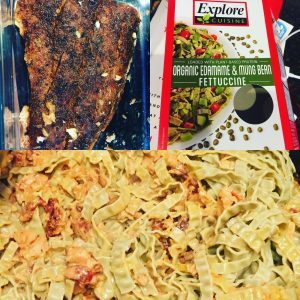 I used julienne sun-dried tomatoes packed in oil. When adding the tomatoes, I choose to drain the oil. Once the shallots and tomatoes are mixed well, I added the salmon (broken into pieces with a fork) and heated the mixture through. It doesn’t take long as the salmon is pre-cooked. Just before adding the cooked pasta, I like to add about 1/4 cup of heavy cream to make the mixture a little saucy. And Voila! A new tasty dish made from leftovers. You can opt for other ingredients such as mushrooms, green peas or asparagus as well. It all depends on what you like and what you have available as well as what needs to be used up in your refrigerator. Don’t throw away, make it into something else. Go further with food!